Everyone has heard about the student debt crisis. 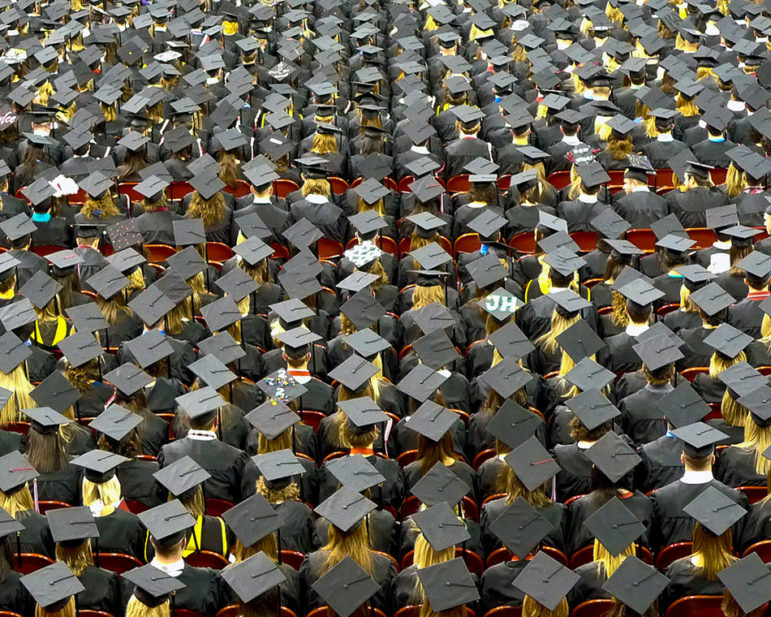 More than 42 million people owe a total of $1.3 trillion in student debt. In California, the average debt for an individual graduating from a four-year institution is $21,382. Student debt isn’t new, but since government has invested less and less in education over the last 30 years while the cost of college has continued to go up faster than the cost of anything else in our society, the accumulation of student debt has progressively gotten worse. Scams, predatory loan practices, and college closures have compounded the problem. Parents who are still paying off student loans can’t save for their children’s future education. Young workers are stymied from saving for retirement, leading to economic troubles later in life. If you’re not nodding your head because of your own experience with student debt, ask your friends or colleagues—it’s ubiquitous, but people tend not to talk about it without some coaxing. Student debt is not just an issue for individuals, their families, and their life options. Student debt directly affects nonprofit organizations, too. Student debt is now so common that we estimate that more than 200,000 California nonprofit staff have student debt. Even presidential candidates are talking about student debt, and recently Rep. Eric Swalwell (D-CA) introduced HR5899, The Forgiveness for Public Servants Act, which would strengthen the Public Service Loan Forgiveness program for nonprofit staff. I entered law school fully intending to work in public service and I plan to do so. But that also means that I plan not to have children, not to own a home, and to save very little for retirement. That is a bummer, and I’m not sure it’s a plan I’ll stick with. My student loan debt…influenced what jobs I could accept after grad school—even what internships I could accept while in grad school—which then influences what kinds of jobs I could get afterwards. I have tended to stay in higher paying subsectors of the nonprofit sector in order to have a salary that lets me pay back my loans. While student debt is a personal issue for nonprofit employees, it is also a management issue for nonprofit organizations, and a public policy issue for the nonprofit community. Student debt burdens can seem insurmountable, leading some to abandon nonprofit work. Student debt is a hindrance to recruiting employees who are diverse in racial, ethnic, and other qualities. For example, many nonprofits require bachelor’s degrees as a minimum education level for applicants, but very few have systems in place for supporting staff with debt. This disproportionately impacts people of color and people who are the first in their families to graduate college—groups that tend to graduate with more debt—and shrinks the pool of applicants for nonprofit jobs. CalNonprofits has launched the Nonprofit Student Debt Project to combat the student debt crisis and its impact on nonprofits and the important work they do. I work for the same nonprofit that helped me change my life while incarcerated. I love this work, but with a large student debt, no retirement, and having to pay for healthcare I’m wondering how I will ever be able to be present in this freedom I worked so hard for. Student debt is overwhelming for many, but not for everyone. Sixty-four percent of respondents have debt below $50,000, and only 12 percent have debt of $120,000 or more. Perhaps the most significant finding for our community was that awareness of the Public Service Loan Forgiveness program was very low: only 17 percent of nonprofit staff and 13 percent of nonprofit HR managers and executive directors described themselves as “informed” about the PSLF program. Does student debt burden negatively affect your ability to build your workforce? The Public Service Loan Forgiveness (PSLF) is a program of the U.S. Department of Education; it forgives the remaining balance of Federal Direct loans after 120 monthly payments (i.e., 10 years) are made through a qualified repayment plan (there are several) while employed by a qualified employer, typically a nonprofit or a government agency. Individuals can work in any position at any 501(c)(3) nonprofit, but they must work full time (multiple part time positions at different nonprofits can add up to full time). They can be the CEO, a bookkeeper, a social worker, or a museum curator—any position. The PSLF Program will begin accepting applications for loan forgiveness sometime in 2017, when the first borrowers will become eligible. Nonprofit staff with student debt should start now taking initial steps such as confirming eligibility, working with their nonprofit to complete the Employment Certification Form, and possibly consolidating loans. Later this month, you’ll see a follow-up article here at NonprofitQuarterly.org with more specific instructions and FAQs about how to apply. Learn about the Public Service Loan Forgiveness program. If you are eligible, begin the process of applying. Tell your coworkers, friends, and family members about the PSLF program. Find ways to combat the stigma of student debt by being open about your debt and what you are doing about it. Find out through an anonymous survey how many of your employees have student debt and if they are aware of the Public Service Loan Forgiveness program. Distribute information, bring a speaker to your organization’s lunchroom, let staff know about CalNonprofits webinars on student debt, and in other ways help employees qualify. Look for the forthcoming Nonprofit Employer Toolkit on Student Debt, soon to be published by CalNonprofits. Raise the issue with the management team and the board as a crucial HR issue affecting recruitment, retention, and diversity. Stay involved with legislative and policy issues affecting student debt held by nonprofit staff. Even if you aren’t in California, consider joining the CalNonprofits mailing list to stay up to date on these. Remind people that who and what they vote for will impact the future of the Public Service Loan Forgiveness program and other student debt alleviation programs. Participate in discussions about organizational and policy decisions to support the strength and diversity of the nonprofit workforce. The Nonprofit Student Debt Project of the California Association of Nonprofits—CalNonprofits—provides online information, webinars, and other resources for nonprofit employees with student debt as well as for nonprofit employers. Because the Public Service Loan Forgiveness Program is a national program, information is applicable not just in California, but across the United States. For more information, please contact Nonprofit Student Debt Project Manager, Christina Dragonetti. Nancy Berlin is Policy Director at CalNonprofits. Christina Dragonetti is the Nonprofit Student Debt Project Manager at CalNonprofits. Katie Kleinsasser is a Staff Writer at CalNonprofits. Jan Masaoka is CEO of the California Association of Nonprofits (CalNonprofits) and is a leading writer and thinker on nonprofit organizations with particular emphasis on boards of directors, business planning, and the role of nonprofits in society. Her books include Best of the Board Café, Nonprofit Sustainability: Making Strategic Decisions for Financial Viability, and The Nonprofit Guide to HR. She has been named eight times as one of the “Fifty Most Influential People” in the nonprofit sector nationwide. As a volunteer she serves on Independent Sector’s Policy Committee. The city of Charleston sues a nonprofit for failing to repay a loan originally financed by the city.